I wrote about the “Hail Mary” photo technique last week in this column. This is where you raise your camera and arms up in the air and direct your camera down toward a subject. It can provide a unique vantage point and possibly an unencumbered view of a subject in tight quarters. Sometimes photographers will mount their camera on a long monopod and use the same technique using a remote shutter release device. Recently I took a photograph that was a reverse of the Hail Mary. I don’t think there’s a name for it but let’s call it the Hail Aussie or Snake-in-the-Grass technique since it all starts with a photographic approach from down under. Brendan Davis, 2, as a Scottish golfer, checks for candy just dropped in his pumpkin by Weaver’s employee and fancy-stockinged witch, Toni Gariglietti. I was photographing a trick-or-treat event on Halloween when I spotted a store employee passing out candy in green and black stripped socks. I quickly envisioned using the stockings as a setting for a photograph. 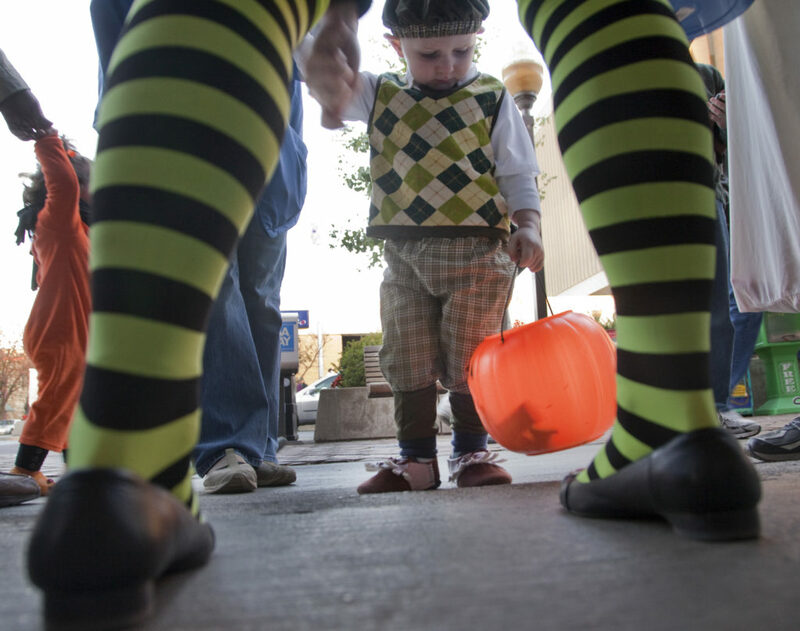 By laying my camera down on the ground and behind the woman, and with a wide-angle lens on my camera, I could use the stripped stockings to frame a child approaching her for candy. Like the Hail Mary idea, I could not see what my camera was capturing so it was an exercise in constant guesswork and moving the camera as both the woman and children interacted. I pre-focused my lens on an area just beyond the woman’s shoes so the trick-or-treating child would be the object in focus. I tried some test shots as the first few children approached for candy. I quickly realized that only if a very short child entered the frame would their body fit within the vertical frame. But as luck would have it, not only did a very small child approach, but he was also wearing an outfit of green and black. I snapped 4 to 5 photographs, making sure I had my camera titled back so my lenses field of view would encompass the kid. While the best resulting frame did cut off the top of the boys head slightly, I was pleased enough with the results to submit it for publication. This same technique is also good with flowers or any subject that is low to the ground. Pay attention to your exposure and focus, review your results often and just experiment. Tim Forcade and I are doing our second in a series of photography classes Nov. 22 at Teller’s. It will be a Photography 101 class that deals with the selection, set-up and use of digital cameras. Contact me at myoder@ljworld.com for more information or to give us suggestions on future classes you would like taught.